Whether it’s spilt coffee, a pet accident or your toddler’s latest masterpiece, it seems no matter how hard we try, our carpets are constantly being decorated by stains. When it comes to stain removal, time is unfortunately not on your side. As soon as you spot a pesky yellow stain, it’s time to get to work. For non-wool carpets, mix 1 tablespoon of ammonia with 1 cup of water in a clean spray bottle. Be sure to use rubber gloves and avoid contact with skin. Then, simply spray the solution directly onto the stain and work it in with your fingers or a clean dry cotton cloth. If you’re working on a wool carpet, follow the same method using 1 tablespoon of dish soap with 1 cup of water. Once your solution has been worked in, take your scrubbing brush and gently work in circle motions. Then, use a dry cotton cloth and dab the area, pressing firmly to absorb all remaining liquid. Once the area has dried completely, the stain should be gone. 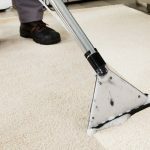 Carpet Cleaning: Professional vs. DIY	 6 tips to banish dust mites from your home…	 Carpet Cleaning Sheffield Review by Mr Webster of Deepcar.